Camping nowadays has become more and more simple. With the advent of lightweight and portable camping equipment, it is easy for us to move around with our gears while keeping in touch with the modern world. In this article, I will give it a shot and review six best portable power stations for camping. These green power sources are not only eco-friendly options but also famous for their transportability and practicality. Rockpals 250-Watt Portable Generator is a reliable power source, designed exclusively for camping and domestic uses. The maximum capacity of this generator is 222Wh. It is enough to power mini camping appliances such as TV, fans, CPAP device and so on. Featuring 120V AC ports, the Rockpals can handle most camping appliances such as laptop, air mattress pump, TV, lamp, and sensitive electronic devices. The pure sine wave technology provides stable and clean current for laptops, tablets, and smartphones. It also comes with temperature and overcharges protection to ensure the safety for both generator and devices. What’s more, it offers four 12V DC ports with a cigarette lighter socket and 2 USB ports. That makes charging multiple appliances at the same time more comfortable. 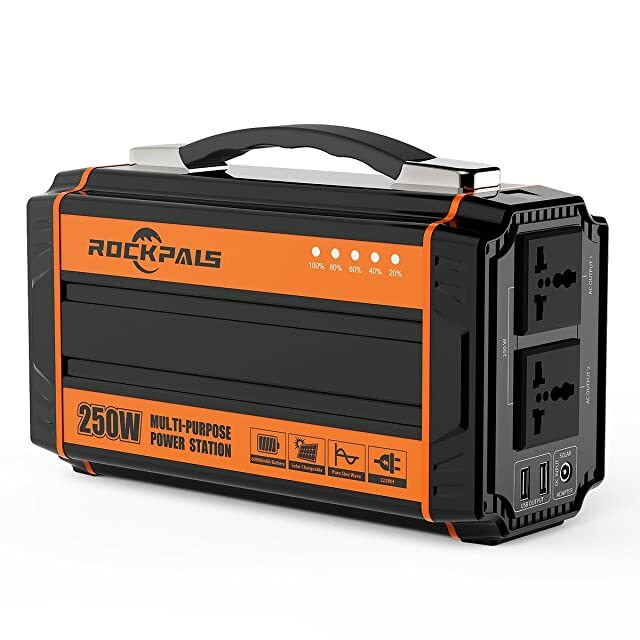 Rockpals 250-Watt Portable Generator functions with the surge wattage of 300W and running wattage of 250W. If this is not enough to you, consider the RP300W portable generator with running watts of 300W and surge watts of 600W. RP250 adopts a 222Wh lithium polymer battery as its power source. According to Rockpals, it can charge up smartphones 25 times, provide up to 3 to 4 hours of power for TVs and mini-fridges. As for the CPAP machine, this generator offers over three nights of continuous use. The manufacturer recommends users to use a DC converter when powering CPAP machines. It doesn’t come with the package, so you have to buy it separately. You also need to switch off heater or humidifier. This generator is environmental-friendly. You can charge up the battery using a wall AC socket or a solar panel. That’s also what I like about this model. Thanks to the MPPT technology, which means Maximum Power Point Tracker, the RP250W can optimize the polar power source. As a result, it reduces the charging time to 40% compared to other units with the same technology. The manufacturer recommends using a 60W solar panel for this generator. You must purchase the panel separately. It takes up to 10 hours for the generator to be fully charged via a solar board. As a clean power station, the RP250W emits no fumes and more importantly no noise. It is an excellent choice for outdoor activities and camping purpose. This power unit comes with a handle and compact design. It weighs only 5.5 lbs. The lithium polymer battery is also lightweight. That makes transporting effortless, be it across rooms or from campsites to campsites. What I don’t like about this model is the long charging time. If you solely depend on the solar panel for charging, it can take up to 15 hours for the generator to function. It is not ideal when you go camping on a cloudy day. All in all, I do believe that Rockpals 250-Watt Portable Generator will bring you a great bang for the buck, considering its transportability and high functionality. Campers should not ignore such a lucrative deal. 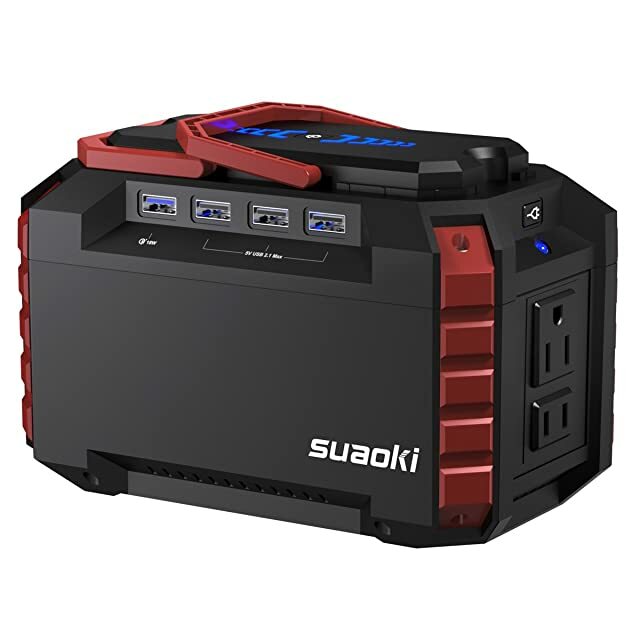 Suaoki S270 Portable Power Station is the second power station I want to review in this list. As you can see, compared to the PR250W, this small power station only offers a maximum capacity of 150Wh. It is indeed not a very appealing option for those who need to use many camping appliances. However, if you only need a portable power source for small electronic devices, the Suaoki S270 is perfect. With 150Wh capacity, it can handle from smartphones, laptops to fans and lights. Suaoki offers three different powering options: two AC ports, four 15A/180W DC ports, and a QC3.0 USB port. As a result, you can run different devices at the same time, as long as the total wattage doesn’t exceed the maximum capacity. Featuring the front-line Quick Charge 3.0 technology, this unit can speed up the charging time of smart devices such as tablets or phones. Now your smartphone is almost always ready to use. Suaoki emphasizes product safety. It offers built-in emergency tools such as BMS (battery management system) to manage the voltage, temperature and many more. Especially when most of your camping appliances are sensitive, these safety features are essential. What I love about this power unit is that it is surprisingly small and lightweight. It is roughly 3 lbs with a size of 7.3 x 4.3 x 4.7 in. Furthermore, it comes with two foldable handles. 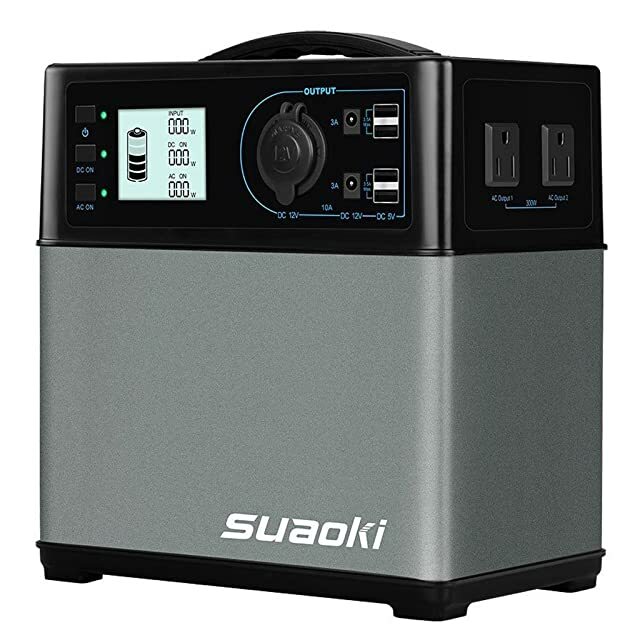 If transportability is what you are looking for, I highly recommend the Suaoki Portable Power Station 150Wh. When it comes to input modes, there are three options. If you want an eco-friendly one, go for solar power. The S270 can connect to a 60W to a 100W solar panel and get power directly from the sun. The power bank comes with an MC4 connector for this powering option. What’s more, it is equipped with the MPPT power controller, so that the charging time could be much faster. But it still depends on the light intensity. Under ideal situations, the S270 requires only 8 hours to be fully charged. For a small power bank, this is a perfect amount of time. The only problem is you have to buy a solar panel separately since it is not included with the power bank. Other than that, the S270 can be charged through AC wall sockets or even via your car 12V socket. The good news is the package comes with a car charger. Those who travel by car would appreciate this feature very much, especially when their solar panel is unusable due to the light condition. Suaoki Portable Power Station 150Wh is an excellent choice for minimalist campers who don’t require a great deal of electricity. Webetop 155Wh 42000mAh Portable Generator is another alternative for small camping power banks. The maximum capacity of this unit is slightly higher than the S270, which is 155Wh. It also offers three different output options: three 12 V DC, a 230V AC and three 6A USB ports. Though the overall capacity is not too high, it can still handle multiple small devices at the same time. Featuring inverter technology, this small power bank is safe to use with sensitive electronic devices such as smartphones or tablets. It comes with five safety protections including short-circuit, over-current, over-power, low-voltage, and over-temperature. This makes Webetop the most reliable power source for camping. What I particularly like is the built-in light, which stays illuminated for 125 hours. It provides a great use for outdoor activities, especially when you want to cook or search for something. This power unit features three different input power. If you plan on taking it on summer camping trips, I advise you to use a solar panel. Though you have to purchase the board separately, the power source is available and super clean. The manufacturer advises users to buy 18W to 50W solar panels. The charging time (for 50W panels) is about 9 hours under ideal circumstances. If solar panels aren’t good ideas, you can charge the power bank through a wall outlet or car socket with the included charger. Solar-powered Webetop 155Wh 42000mAh Portable Generator guarantees noiseless operation and no harmful fumes or heat. Unfortunately, there are drawbacks regarding the battery. Even if it is fully charged, you can only use up to 95% of the whole capacity. What’s more, charging could be daunting at the final stage. So I would recommend you to power the Webetop up to 12 hours in the first time. 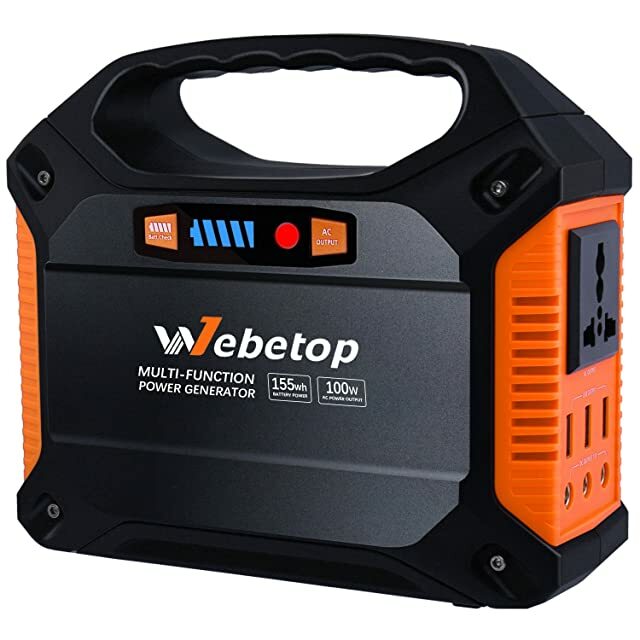 I do believe that the Webetop 155Wh 42000mAh Portable Generator is an excellent option for camping, especially when you value its reliability and portability. Those who have a low level of electricity demand should go for this model. Goal Zero Yeti 400 Lithium Portable Power Station is a high-end product that has received many positive remarks recently. At the first look, the Goal Zero Yeti looks more like a printer to me. It is a portable lithium battery. You can quickly charge it up and bring it around for camping use or other outdoor activities. As for the design, I love the modern appearance with a touch of yellow lines over the gray background. The plastic case doesn’t seem fragile. Making from a rigid material, it protects the internal battery well. What’s more, the overall weight is only 16 lbs. It is not as light as the Webetop or Rockpals, but it is indeed portable. With the metal handles, it makes transportation much more convenient. This power bank features two 120V outlets, USB ports that can handle seven devices at the same time. It offers 428Wh of power capacity. The item produces 1200w of surge wattage and 300W of running one. The pure sin wave inverter allows it to charge up sensitive devices such as phones or tablets. Other than that, the Goal Zero Yeti 400 can work with small household and camping appliances such as lights and min-fridges. The great thing about this power bank is it creates no sound and no fumes. You can use a clean and renewable source of power to charge the battery up. There are two options: either AC wall socket or solar panels. You have to purchase the panel separately. If you choose the second option, the power station only needs 4 hours to be ready. With an AC wall socket, it takes 7 hours. What’s more, the model offers built-in pass-through technology, allowing you to use it while still charging. The only problem with this power station is that it is not a wallet-friendly option. 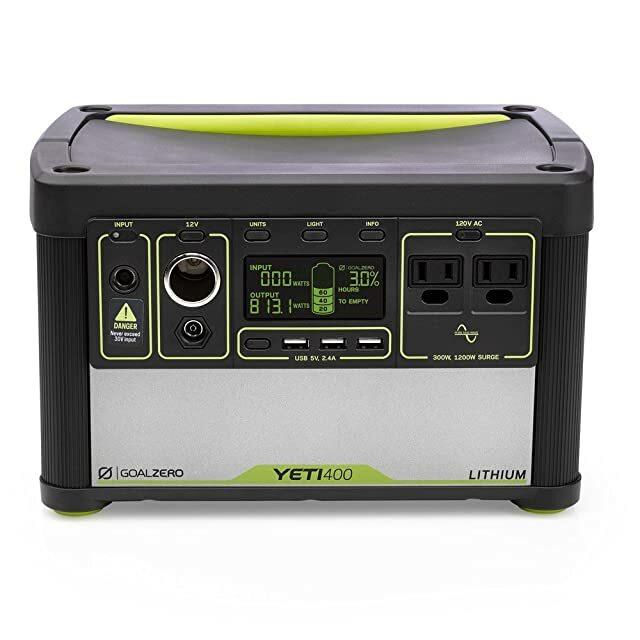 The Goal Zero Yeti 400 Lithium Portable Power Station is a top-notch choice for campers who are looking for a reliable and durable power source. If you don’t mind spending a bit more for the quality and your high electricity need, this is really a product for you. Suaoki 400Wh/120,000mAh Portable Solar Generator offers the highest power capacity in the list, which is 444Wh. The surge watts are 600W, and the running watts are 300W. The ratings are favorable when it comes to small camping appliances and electronic devices. Thanks to the Battery Management System (BMS), the built-in regulator ensures the safety of the battery and plug-in devices. According to the manufacturer, the power capacity allows the generator to charge up smartphone over 50 times and tablets over 13 times. As for the output, there are more than three traditional options that most power stations offer. Other than AC, DC, USB outlets, the package comes with a 12V outlet and a jumping port for cars as well. You can either charge the Suaoki Portable Solar Generator with your car with the charging hours of up to 11 hours. Other options include solar charger (with a separate solar panel) or AC wall socket. The design is a bit bulky for me. It is not weighty, but it looks like something I can’t hold up for long. The item features a handle so that you can carry it around easily. What’s more, it features an LCD to help you keep track of battery level. Suaoki Portable Solar Generator can power up your camping appliances and give you the most reliable source of energy. Since it offers the highest power capacity, the Suaoki is perfect for who have a high power demand. The last item in the list is the Anker Powerhouse 400Wh / 120000mAh Portable Generator – a robust and reliable source of power. The unit includes several 3350mAh 18650-cells batteries. The robust batteries allow this generator to produce a substantial capacity of 400Wh. With this power, the Anker Powerhouse can charge smartphones up to 45 times, flashlight up to 21 times and Bluetooth speakers up to 14 times. As for the output options, the model offers one 12V DC outlet, four 30W USB and one 120W AC ports. It is versatile since you can plug in various appliances from car chargers, CPAP machines, digital camera, to speakers and smartphones. The Anker Powerhouse can light up a 15V lamp for over 100 hours, making camping in the dark and searching things easy as ever. For recharging option, this power bank only takes one type of input: a DC 16V/8A port. That seems to be a drawback; however, the charging time is surprisingly short. It only takes the unit 5 hours to be ready. Compared to other power stations and portable generators, the rating is quite impressive. Personally speaking, its dimensions are a bit bulky. Yet considering the 400W capacity, it is safe to say that this generator is compact compared to its counterparts with the same power rating. It weighs 9.26 lbs and features a collapsible handle. I also fond of the smooth silver metal design. Though the cover is made of plastic, it doesn’t look flimsy at all. 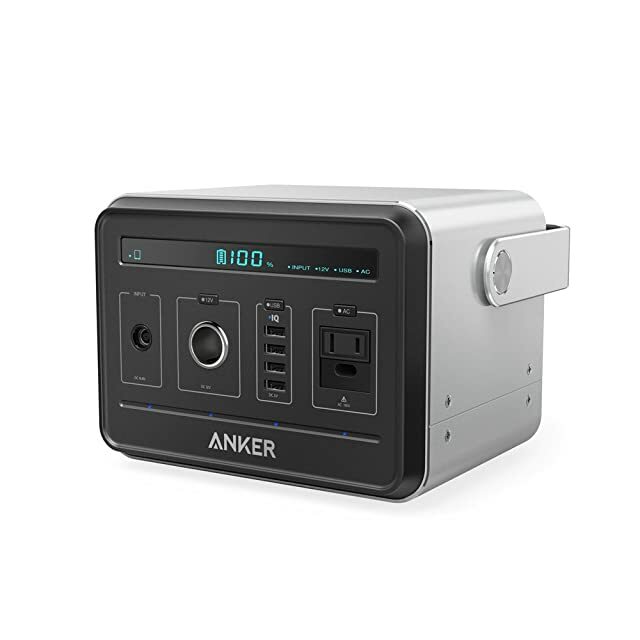 My final thought is the Anker Powerhouse is undoubtedly an outstanding generator with high power capacity, suitable for not only camping use but also in emergency situations. It isn’t easy to answer how many watts are enough for camping appliances. Some people want to bring with them the modern comfort, so they have fridges, TVs, lights, ovens and so on. These appliances are power-hungry; therefore, they need a high-capacity generator. In this case, their only choice is fuel-powered generators. They supply powerful yet not eco-friendly energy. In recent years, I try not to bring as much as I used to. I realize that camping is a great chance to run away from the chaotic city life. Thus, it makes little sense if we bring too many things with us. That’s why, for light camping trips, I use portable power stations instead of robust generators to power my appliances. On these particular trips, I only take with me small electronic devices. Since most power stations offer a limited capacity, it is essential to determine appliances’ wattage. That way, you can ensure that the overall watts will not exceed the power bank’s capacity. These portable power stations for camping are superb choices for minimalists who want to maintain the least contact with the modern world. They supply renewable energy – extremely clean and harmless to the environment. If you’re going to find one, you should definitely choose from these six best portable power stations for camping.